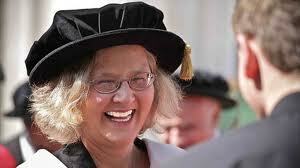 Elizabeth Blackburn, an alumna of Darwin College and a recipient of an Honorary Doctorate of Science from the University earlier this year, has been awarded the Nobel Prize in medicine. Professor Blackburn, along with Carol Greider and Jack Szostak, has been awarded the 2009 Nobel Prize for her research on telomerase, an enzyme she discovered in 1985 with her then PhD student Dr Greider. Telomerase, which adds DNA to the ends of chromosomes in cells, plays a key role in cancer development and has been the focus of much cancer research since its discovery. Professor Blackburn is an Australian citizen, who earned her BSc (1970) and MSc (1972) degrees from the University of Melbourne, and her PhD (1975) from Cambridge, where she was a student at Darwin College. She did postdoctoral work in molecular and cellular biology from 1975 to 1977 at Yale, joining the faculty of the University of California at Berkeley in 1978, and moving to University of California, San Francisco in 1990 where she is currently Professor of Biology and Physiology. She is a Fellow of the American Academy of Arts and Sciences (1991), the Royal Society of London (1992), the American Academy of Microbiology (1993), and the American Association for the Advancement of Science (2000). She was elected Foreign Associate of the National Academy of Sciences in 1993, and was elected as a Member of the Institute of Medicine in 2000. The University of Cambridge has more Nobel Prize winners than any other institution. Including today’s announcement, there are currently 84 affiliates of the University who have won the Nobel Prize since 1904. They have won in every category, with 29 Nobel Prizes in physics, 24 in medicine, 19 in chemistry, seven in Economics, two in literature and two in peace.